Adding balloon twisting to your party will entertain your guests for hours. We take an interactive approach and let your child choose what they would like to see created. Your kids will be delighted when they see a normal balloon transform into a dog, a sword or flower - the options are endless! Our Balloon Twisters are experts not only in twisting and turning balloons into wonderful creations, they also know how to engage kids! One host can engage and delight up to 30 kids per hour, and if you know you'll have more than 30 kids, we can make sure we send 2 hosts to ensure no kid misses out. Imagine it, and our professional balloon twisters can twist it! 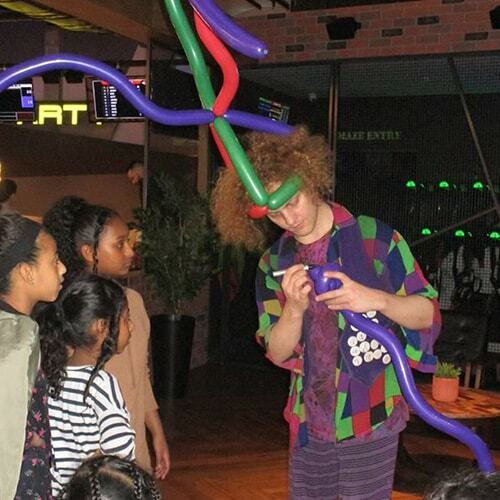 Balloon twisting is a fantastic addition to any kids event as it is suitable for kids of all ages! We can cater for any group size, larger groups will either need a longer time or more than one balloon twister to ensure every child gets a balloon. If you're unsure what will be best for your party, give us a call so we can specifically cater a balloon twisting package to your needs. Get in touch with Amazing today to plan your perfect Balloon Twisting entertainment. Book online today, or to speak with an Amazing Concierge, call or inquire online.